Description This Lithonia, Georgia hotel has an outdoor pool, free internet access, non-smoking guest rooms and free breakfast. This hotel is also pet friendly. 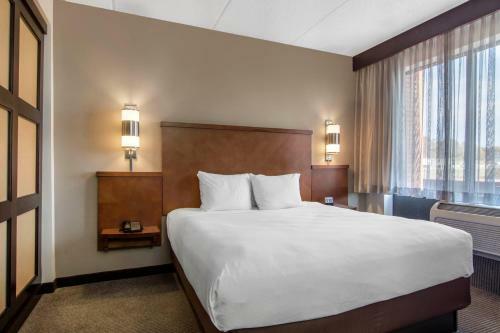 With large rooms 42-inch flat-panel TVs and free Wi-Fi the Comfort Suites is a local favorite of our guests. The five-story hotel has 83 non-smoking rooms with separate areas for working sleeping and relaxing. There's a wet bar with a refrigerator for snacks an oversized sofa bed to lounge in while watching the 42-inch flat-panel TV and ample desk space for surfing the web with free Wi-Fi. In the cozy lobby linger over a specialty Starbucks coffee or dine on made-to-order meals at the 24-hour cafe which also serves beer wine and cocktails. Start your day with a free continental breakfast buffet stick to your workout plan at on-site exercise room and escape the summer heat in the seasonal outdoor pool. Additional amenities include meeting space and a business center. The hotel is walking distance from dining and shopping at Stonecrest Mall. It's 17 miles to Stone Mountain Park 18 miles to downtown Atlanta and 22 miles to attractions like CNN Center Centennial Olympic Park and the Georgia Aquarium. Hartsfield-Jackson Atlanta International Airport is 27 miles away. 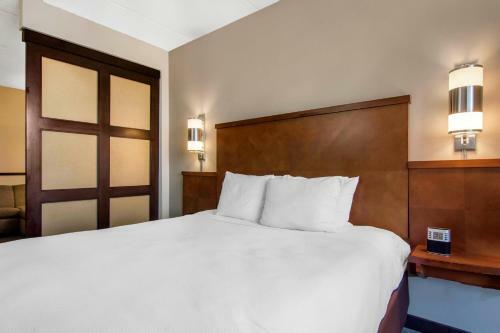 Add Comfort Suites to your free online travel itinerary.